Finer Focus melts away your Menu bar, Dock, Finder Icons and background Windows. So you can fine-tune your focus and work without distraction. Finer Focus can dim, blur and fade the distracting elements of your Desktop, leaving you with a more elegant and cinematic environment where your focus is fine-tuned and your workflow enhanced. Yet when you need, simply mouse over these elements and they will brighten and become once again sharp and ready for use. And when you bring a new window to the front, it becomes highlighted and the previous window gracefully dims, blurs or fades quietly into the background. With Finer Focus, you control the the dimming color and amount. You choose what to blur and fade and how much. 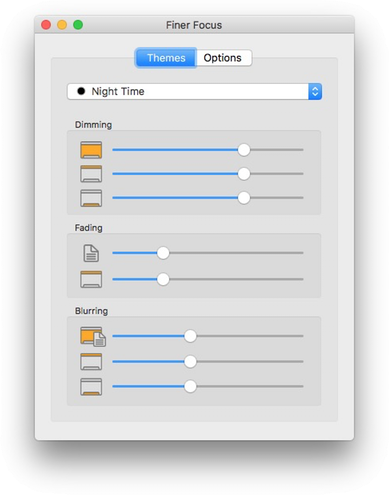 Start by browsing the provided Themes to see which you like best by selecting each Theme from the Finer Focus Menu bar Icon. If a Theme works for you as-is, great. If not, you can customize it to your liking. Once you've decided on a Theme, you can customize it by selecting Settings... from the Finer Focus Menu bar Icon. Note: the "As You Wish" Theme allows you to choose its Dimming Color. In the Settings, you can also optimize various features of Finer Focus itself. 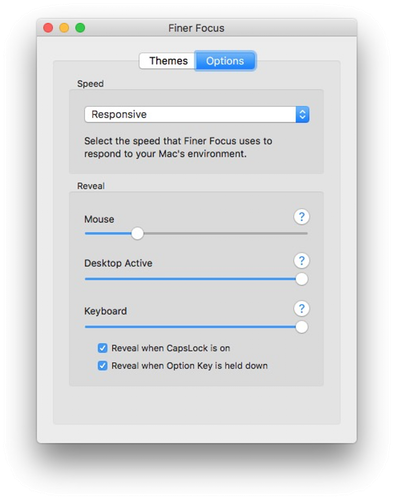 You can specify how quickly or slowly you would like Finer Focus to respond to your Mac's environment. This will control the speed at which elements dim, blur and fade. There are times when you want Finer Focus to reveal all of the elements of your Mac, such as when your Finder Desktop is the active window, or you are draging-and-dropping between windows. For these (and other) occasions you can control when, and how much, Finer Finer should reveal of these elements. You can have Finer Focus reveal when you move your mouse off of the front window that you are working in. By default, this is set to an amount of reveal that is minimal so this won't have any effect. However, this is useful if you increase the dimming of a Theme to be very dark; when you mouse over the dark area, Finer Focus will reveal the elements behind it. You can indicate how much you want to reveal when you make your Finder Desktop the active window. For the times when you want to manually reveal, you can configure Finer Focus to do so when you either have CapsLock in effect or when you hold down the Option Key. You can also indicate how much you want to reveal in these cases. If you want to reveal for an extended length of time, you can simply choose the "Crystal Clear" Theme which is equivalent to turning off Finer Focus. Download Finer Focus and try it for free. 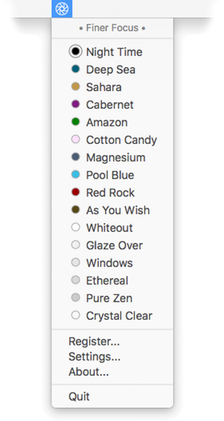 See for yourself how it improves your focus while also making your Mac more relaxing, elegant and, well, just cooler than everybody else's.